Larimer County Sheriff’s deputies responded to a report of an injured woman at the intersection of Buffalo Creek Parkway and Crazy Horse Lane in Wellington at approximately midnight last night. Upon arrival, deputies discovered a 25-year-old Wellington woman with serious injuries to her head and face. The vehicle involved in the incident had left the scene. The woman was taken to a local hospital. Her condition is unknown. Upon investigating, deputies discovered that the 25-year-old woman was a passenger in an open door Jeep driven by Joseph Dominic Savell, DOB: 101883, of Wellington. Mr. Savell was driving north on Buffalo Creek Parkway and attempted to turn left onto Crazy Horse Lane at a high rate of speed throwing the victim from the Jeep and resulting in the serious injuries. Mr. Savell was contacted later at his home and arrested for Vehicular Assault, a class four felony, Leaving the Scene of an Injury Accident, a class five felony, Driving under the Influence, a misdemeanor, and Reckless Driving a class two traffic violation. 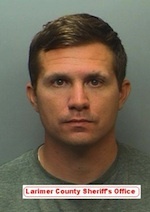 He was booked into the Larimer County Jail where he is waiting the setting of bond. The investigation into the incident is continuing. Anyone with information regarding this or any other crime is asked to call Larimer County Sheriff’s Office at 970-416-1985 or Crime Stoppers at 970-221-6868 where you will remain anonymous and possibly be eligible for a cash reward. Site contents copyright © 2019 Recorder Online	except as noted. All rights reserved. | 90 queries in 2.292 seconds.